1943. —. The year opened with fierce fighting on battlefronts all over the world – Stalingrad, North Africa, the South Pacific. Here, February saw groundbreaking for Oak Ridge’s Y-12 Plant and the X-10 Graphite Reactor. Starting April 1, armed guards manned the gates to the Clinton Engineer Works. President Roosevelt froze all wages and prices to forestall “black markets”. By summer the area swarmed with 20,000 construction workers building the plants and new city, and August saw the opening of the town’s first drug store, grocery, movie theater, and post office. In the fall, enough of Y-12 and the town had been completed, so the scientists, engineers, and thousands of support people began pouring in from all over the nation. One universal complaint everyone had was the mud – even a light shower turned thinly graveled streets into a gooey mess. The town’s answer was 163 miles of boardwalks. For fun, folks went to the movies, bowled, danced in the “rec” halls, and sometimes on the tennis courts. Overseas, the Allied Forces finally defeated the Germans in North Africa, but began the invasion of Italy with heavy losses. The year opened with fierce fighting on battlefronts all over the world – Stalingrad, North Africa, the South Pacific. Here, February saw groundbreaking for Oak Ridge’s Y-12 Plant and the X-10 Graphite Reactor. Starting April 1, armed guards manned the gates to the Clinton Engineer Works. President Roosevelt froze all wages and prices to forestall “black markets”. By summer the area swarmed with 20,000 construction workers building the plants and new city, and August saw the opening of the town’s first drug store, grocery, movie theater, and post office. In the fall, enough of Y-12 and the town had been completed, so the scientists, engineers, and thousands of support people began pouring in from all over the nation. One universal complaint everyone had was the mud – even a light shower turned thinly graveled streets into a gooey mess. The town’s answer was 163 miles of boardwalks. For fun, folks went to the movies, bowled, danced in the “rec” halls, and sometimes on the tennis courts. Overseas, the Allied Forces finally defeated the Germans in North Africa, but began the invasion of Italy with heavy losses. in Honor of All Those Who Built Our Community and in Special Memory of the Vision and Legacy of A.P. Cappiello, Sr. by Cappiello Real Estate and Development, June 2005. Erected 2005 by Cappiello Real Estate and Development. Location. 36° 0.819′ N, 84° 15.473′ W. Marker is in Oak Ridge, Tennessee, in Anderson County. 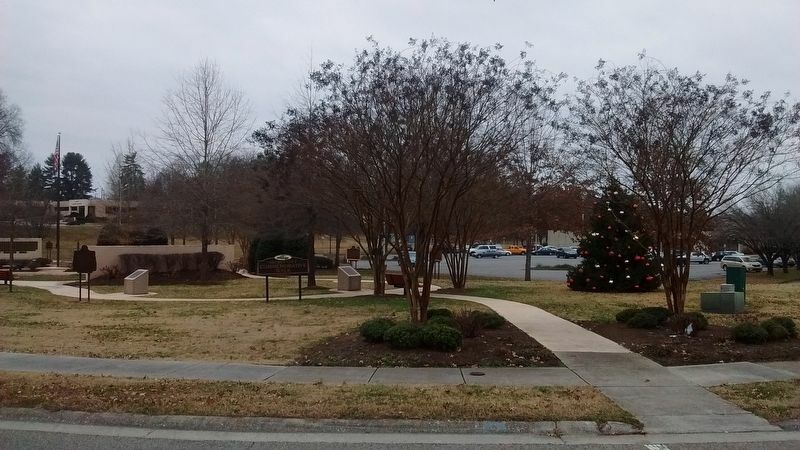 Marker is at the intersection of Oak Ridge Turnpike (Tennessee Route 95) and South Tulane Avenue, on the right when traveling east on Oak Ridge Turnpike. Touch for map. 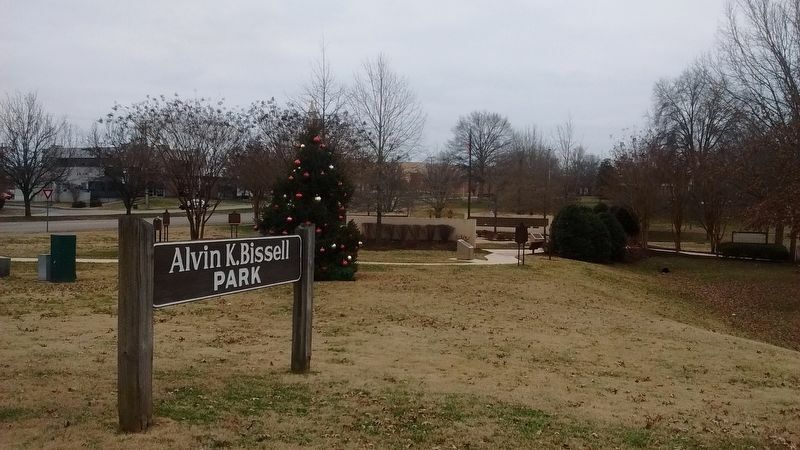 Marker is located at Alvin K. Bissell Park. 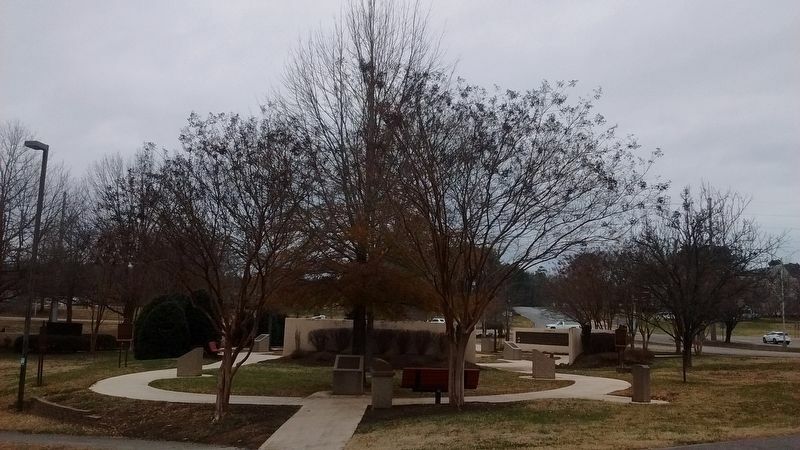 Marker is in this post office area: Oak Ridge TN 37830, United States of America. Touch for directions. Other nearby markers. At least 8 other markers are within walking distance of this marker. 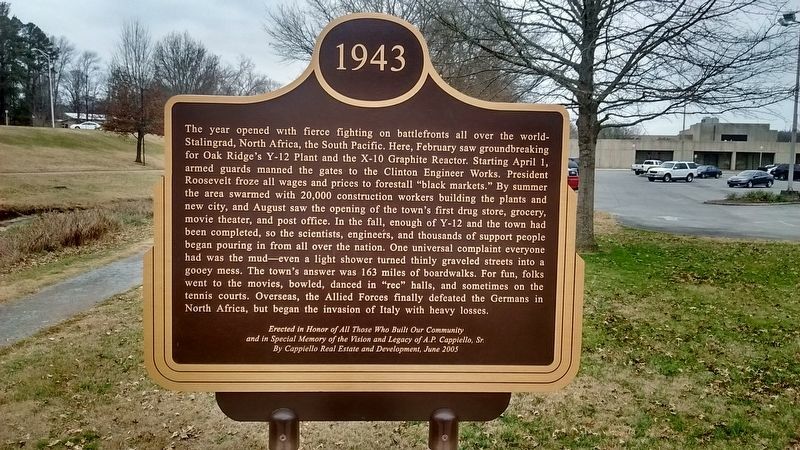 Oak Ridge – Secret City (here, next to this marker); X-10 – The Clinton Laboratories (here, next to this marker); ORINS / ORAU (here, next to this marker); 1942 (here, next to this marker); 1945 (here, next to this marker); Construction Workers (here, next to this marker); 1949 (here, next to this marker); Oak Ridge and the Manhattan Project (here, next to this marker). Touch for a list and map of all markers in Oak Ridge. More. Search the internet for 1943.